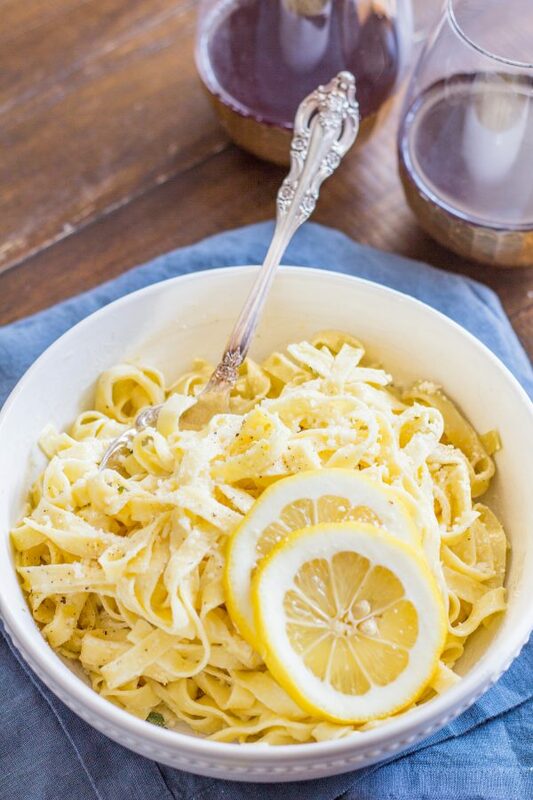 Lemon Parmesan Fettuccine is an easy and elegant pasta with a light creamy sauce loaded with fresh lemon flavor. The total preparation time is only 15 minutes, and it is a meal that you will look forward to on a weeknight. 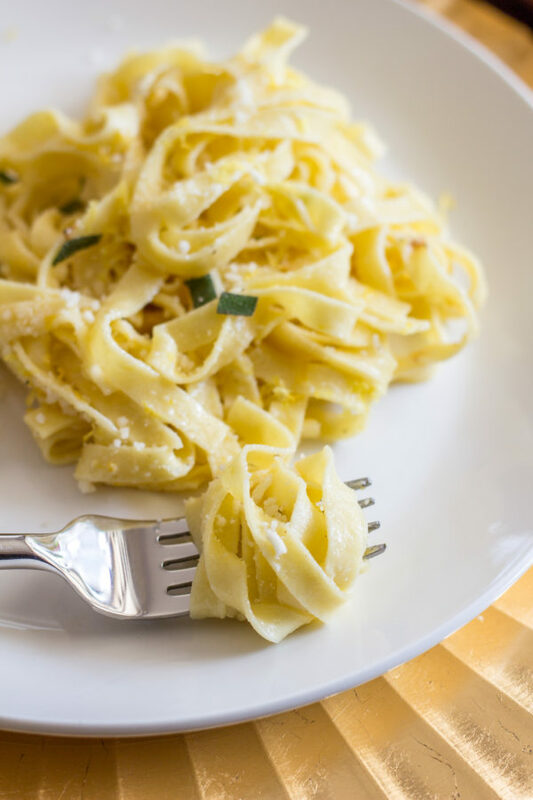 My recipe for Lemon Parmesan Fettuccine was inspired by my favorite item on The Pump Room’s menu. Last year the iconic restaurant changed hands and became Booth One. 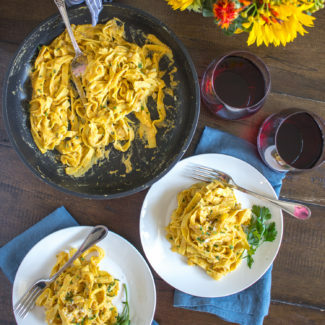 The Lemon Parmesan Fettuccine is no longer on the menu, so I am so happy that I figured out how to recreate this pasta at home. 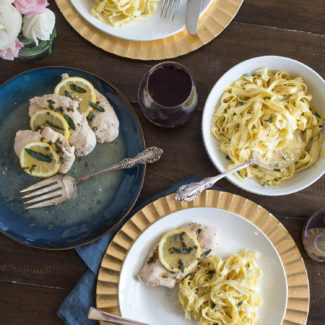 It is light and creamy with fresh lemon flavors and a touch of cheese. It’s refreshing, not heavy. The best part? This recipe takes only 15 minutes to prepare. 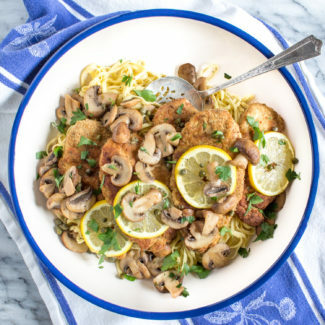 It’s an elegant but easy weeknight dinner option. 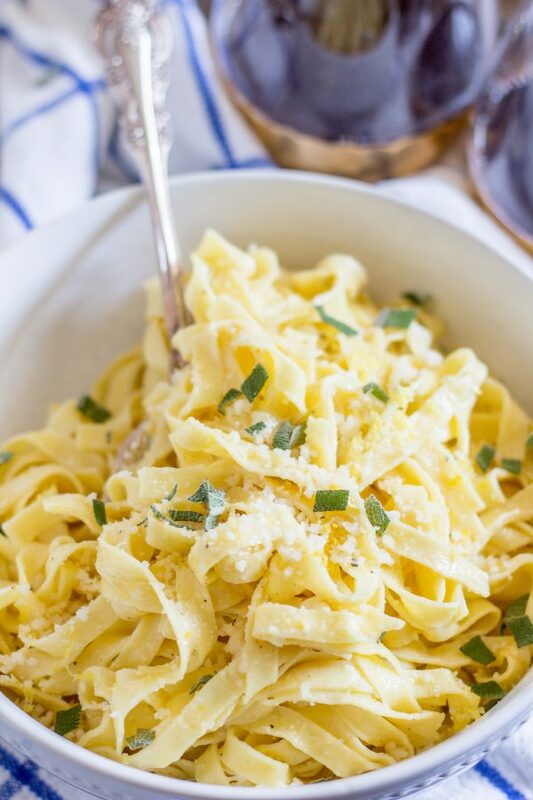 The thing that I love about this Lemon Parmesan Fettuccine recipe is that it is made with only a few simple ingredients that work together in harmony without overpowering each other. 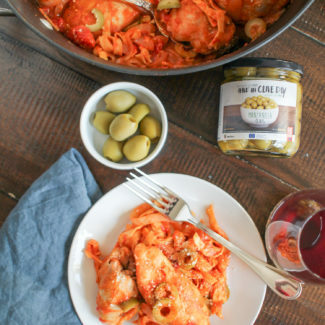 I first shared this recipe three years ago, and when a reader recently left a comment on the post I cringed at the photos and decided it was time to revisit the recipe. Oh how I wish that I could go back in time and study photography, journalism, and coding in college – it’s been an uphill battle to learn these skills over the past 6 ½ years. I did add a sprinkle of chopped sage to garnish the pasta. It added a nice flavor to the pasta, but adding it is totally optional. One thing to know is that since the pasta is lightly coated in the sauce, it doesn’t reheat very well. 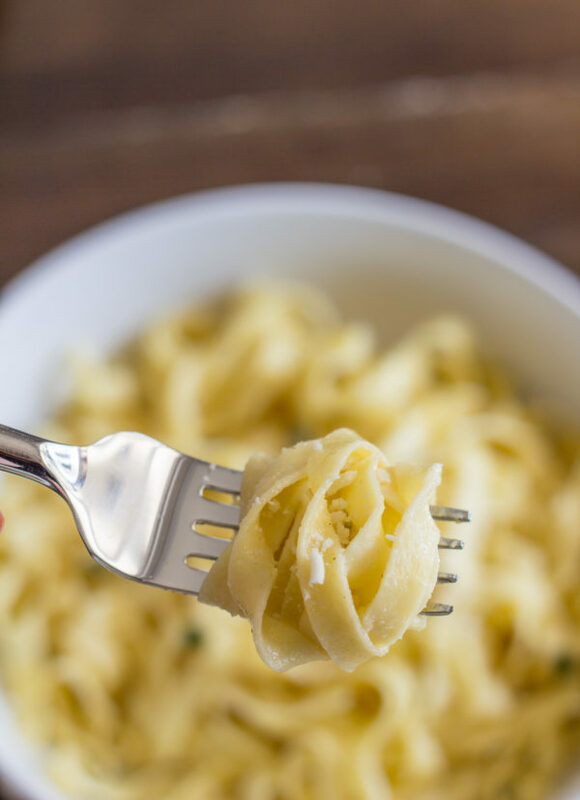 As the pasta sits it soaks up the sauce, so if you need to reheat the pasta I recommend mixing up a couple tablespoons of cream with a tablespoon of water and a tablespoon of lemon juice in a skillet and then adding the pasta to reheat it. When it comes to zesting the lemon, I recommend using a microplane. If you aren’t familiar with what a microplane is, it is a very fine grater. I received one years ago when I visited Southern Living on a press trip. The culinary director of the magazine had picked out microplanes for the gift bags saying that it is his favorite inexpensive kitchen tool. I love how it grates the lemon zest into fine little pieces that practically absorb right into the sauce. One last thing before we get to the recipe – I highly recommend using fresh pasta. It just has more flavor, and it cooks more quickly. I used fettuccine, but you could use any long flat pasta. Tagliatelle, linguine, pappadelle would work well too. 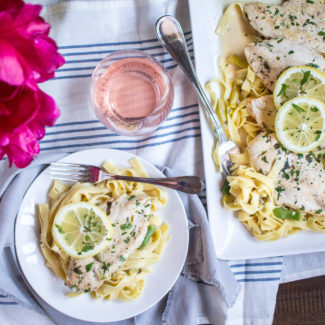 An easy and elegant creamy pasta dish loaded with fresh lemon. Put a pot of salted water on to boil. Meanwhile, whisk the cream, lemon zest, salt and pepper together. 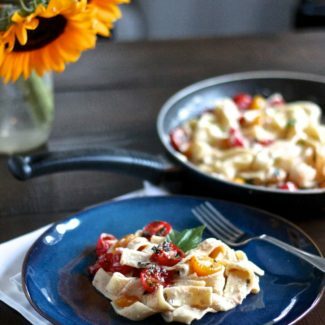 If you are using dried pasta, get it cooking right away. If you are using fresh pasta, it will cook in just 2 minutes, so hold off until the sauce has reduced. Pour the cream mixture into a saucepan over medium heat. Bring the cream to a steady boil, and let it reduce by half. This will take about 5 minutes. Then reduce the heat to low. This is the time to start cooking your fresh pasta. Before you drain the pasta, remove 2-3 tablespoons of the pasta water from the pot. This starchy water helps bind the sauce to the noodles. Drain the pasta. Add the pasta to the cream sauce. 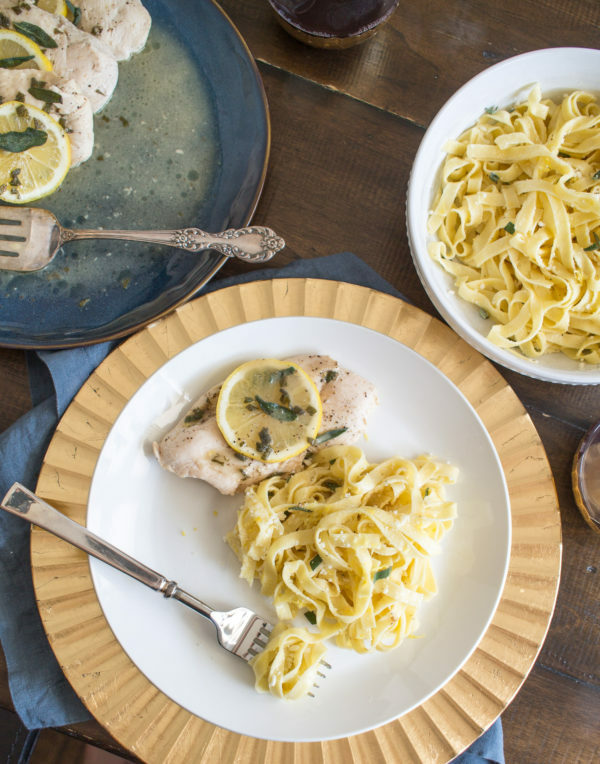 Stir in the lemon juice and 2 tablespoons pasta water. Increase heat to medium. Stir frequently, for two minutes. Add an extra tablespoon of pasta water if the sauce becomes too thick. Plate the pasta, and top with the fresh parmesan.